Run. Ride. Read. Repeat. : Steele My Heart..... Again? Well, as of January 11th, Cupid no longer belongs to my trainer. She's now privately owned and in a full time training program. Her new owner is out at the barn six days a week and Cupid really seems to love the extra attention she is receiving. I would say that I'm jealous but it's pretty hard to be jealous of yourself. Deciding to buy Cupid was almost as stressful as deciding to buy my house. The idea that I am now committed to an expensive animal for the next 20 years is terrifying, but I knew that Cupid is the horse for me. In the past month she's learned to pick up her feet when I say "pick" while tapping the back of her leg, and she now manages to pick up her left lead most of the time. We still have a long way to go but I can't wait to see where we're at in a few months. There are several big changes on the horizon for us but I know that these choices are for the better. The first major change, that I can share, is that I've completely changed some of her tack. I bought us a new saddle that fits her about the same as our old saddle, but actually fits me. We went from a 15.75" Pessoa Pony to a 17" M. Toulouse Premia. Stockman's Harness and and Saddle Shop in Orlando was extremely helpful to work with. I brought in the Pessoa for them to see and walked out with the Toulouse and an HDR. I tried both saddles on Cupid but decided that the Toulouse felt the best on her and felt the best for me. While the HDR was nice it felt like I had no contact with Cupid, and like we were slipping all over. When I went back to Stockman's to return the HDR, the salesgirl helped me find a set of stirrups and matching leathers. This week I plan on going through my barns stash of pony bits to find a softer bit to try. Right now Cupid is in a full cheek corkscrew, which I think is giving me more "woah" than "go". Recently I've had to use a small set of spurs on Cupid and carry my crop. 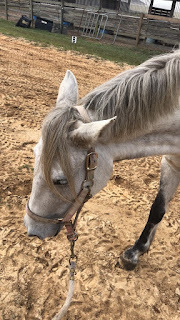 I don't have an issue carrying the crop because she responds to it being flagged in her eyesight, but I don't want to wear the spurs full time. Hopefully taking the brakes off will help us. As for the other changes, those will be announced as soon as I feel comfortable and am sure they'll go through. My plan is to try and us this as a training journal for Cupid. I might not be able to update with pictures every post but I'll sure try!